An adventurous day in contact with nature along Río Blanco: raft along a peaceful stretch of the river offering enchanting views and go for a dip in the fresh blue waters of a spectacular natural pool. We start our adventure by reaching the valley of Río Blanco, characterised by lush vegetation and not far from Ocho Rios. Together with our expert guides, we get ready to enjoy a thrilling experience in contact with nature: we descend along the river on board large inflatable rafts transported by the currents. We go on a spectacular ride on gurgling crystal-clear waters starting from a 17th-century Spanish bridge, passing underneath bamboo leafy vaults and past a historic coconut plantation. 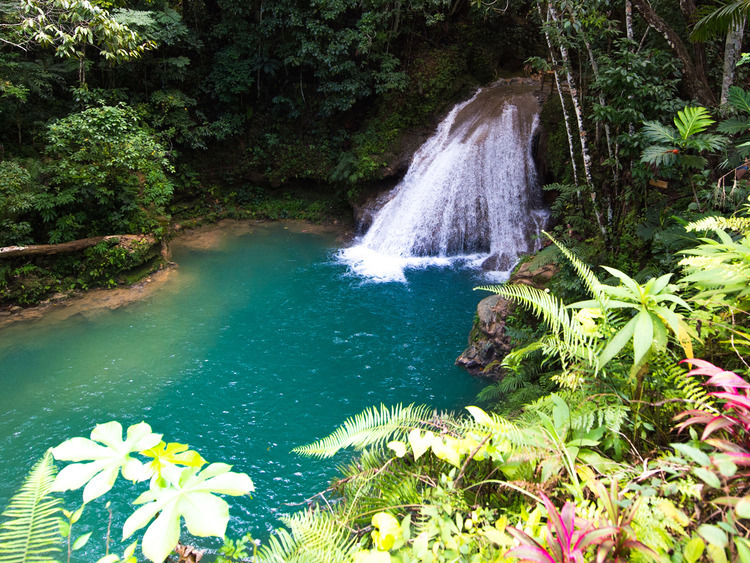 The last stop on our excursion is the fabulous Blue Hole, a natural turquoise pool where we can go for a swim, climb the numerous waterfalls and dive from the rocks. We can also explore the small hidden caves and venture into underwater tunnels literally surrounded by an amazing natural paradise. The descent into the river is done with individual inflatables.